This page covers 5G OTA (Over-The-Air) Test and Measurement parameters. It mentions 5G OTA companies and their 5G OTA test solutions. 5G NR (New Radio) uses different frequency bands across different parts of the world. Moreover there are significant changes in the 5G NR technology compare to LTE standard which include use of mmwave frequencies, massive antenna arrays, dynamic PHY attributes, beamforming and so on. Physical layer attributes are subcarrier spacing, number of slots per subframe etc. Refer difference between LTE versus 5G NR >> for more information. 5G OTA (Over The Air) test setup should provide provision to test DUT in both near field zone (Reactive, Radiating)and far field zone from the antenna used in the testing. The region upto the distance of 2 D2/λ from the antenna is referred as near field region. Where, D is the antenna diameter and Lambda is wavelength of free space. The region above the distance of 2 D2/λ is referred as far field region. The distance upto 0.62*(D3/λ)0.5 is known as reactive near field where as distance between 0.62*(D3/λ)0.5 and 2 D2/λ is known as radiating near field. There are two frequency ranges used by 5G Base Station and 5G UE viz. FR1 and FR2. FR1 spans from 450 to 6000 MHz and FR2 spans from 24250 to 52600 MHz. Hence 5G OTA test solutions or equipments should support both of these frequency ranges. The figure-1 depicts equipments available from Keysight technologies for 5G measurements. Refer 5G Measurements >> which mentions list of 5G measurements required to be performed on transmitter and receiver parts of the 5G Base Station and 5G UE (User Equipment). The figure-1 depicts 5G OTA testing setup from Rohde & Schwarz. The setup uses R&S spectrum analyzer. Refer 5G OTA testing by R&S >> for more information. Following measurements are required to be performed during 5G OTA testing. EIRP: It stands for Effective Isotropic Radiated Power. TRP:	It stands for Total Radiated Power. EIS:	It stands for Effective Isotropic Sensitivity. TIS:	It stands for Total Isotropic Sensitivity. EVM:	It stands for Error Vector Magnitude. ACLR: It stands for Adjacent Channel Leakage Ratio. SEM:	It stands for Spectrum Emission Mask. Following table mentions 5G OTA test and measurement companies and thier solutions. 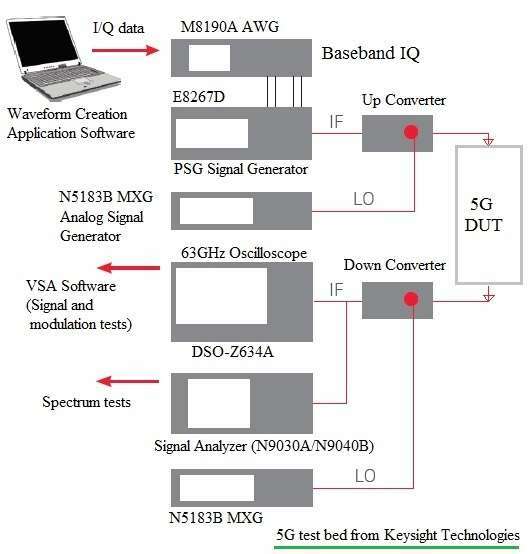 Keysight The figure-1 depicts 5G test equipments. In addition keysight offers E7515B UXM 5G wireless test platform. The E7515B instrument functions as BS network emulator which can be used to perform testing on 5G compliant mobile device or UE (User Equipment). The test setup requires OTA probe antennas along with shielded box and channel emulator. Anritsu The company offers Field Master Pro model MS2090A. It is handheld equipment used for 5G base station testing by 5G BS manufacturers and 5G network operators during installation and troubleshooting. R&S The company offers spectrum analyzer, PWC200 (Plane Wave converter) and compact test chambers (Models ATS800R and ATS1000) for 5G DUT OTA testing. ETS-Lindgren The company offers OTA test chambers which supports sub-6 GHz and mmwave frequency bands. EMITE designs, Spain The company offers various test chambers for 5G OTA testing. E-series is reverberation chamber, F-series is reverberation chamber plus Anechoic chamber and H-series is used as an anechoic chamber. MVG Solutions The company offers multi-probe system, SG3000F automotive test system etc. for 5G OTA testing. The other 5G OTA test and measurement companies are NI (National Instruments), NSI-MI, Boonton, Noisecom and so on.